John was born in New York City on March 23rd, 1917. He was the first son of Helen and Charles Eisenhauer and had a younger brother Allen, who was born 6 years later. They moved to Queens, New York when he was about 8 years old. He attended the local school and graduated from Richmond Hill High School in 1935. His grandparents, the Eisenhauers, lived in the apartment above them. His Father worked as a salesman for a surgical company that sold knives. John’s younger brother Allen joined the Navy and was stationed on the USS Iowa. He was in the band while aboard the ship, where he played the trombone. Allen passed away in 2001. As a young man John liked to collect stamps and had quite a collection of them. He liked to listen to sports on the radio but wasn’t a player. He was a Giants fan and sometimes went to the Polo Grounds to see the games with his friends and also liked to watch basketball games. As he got older he became interested in photography and he and his friends would go around the boroughs of New York taking pictures and later developed and enlarged them in his parent’s house. After school he would go down the street to spend time with his friend, where they just enjoyed talking and listening to the radio. On the radio they would listen to Jack Benny, Bob Hope, Ed Sullivan, The Shadow, The Lone Ranger and some other dramas. He and his friends also liked to go to the local movie theaters and Radio City Music Hall. They liked the westerns, like Tom Mix, Gene Autry and the Lone Ranger, and Hoot Gibson. As a boy he and his friends would also sail their model sailboats on Jackson Pond in Richmond Hill. Gail, John’s daughter, still has his boat the Flying Cloud; it’s very special to her. John named it “Comet”. After he finished high school he had a job in an office in Manhattan, and also worked at the Worlds Fair in Flushing Meadows, NY in 1939. John met his future wife, Dorothy Krumm, on a blind date in maybe 1937 or 1938. He was visiting friends in up state New York and the fellows were dating sisters that were friends of hers. At the time she was a nursing student at Flower 5th Ave Hospital in NYC, so they did get to see each other quite a bit. They didn’t get married until February 7th 1942. Dorothy went down to Fort Bragg, NC where John was stationed and they went to Dillon, SC and got married. 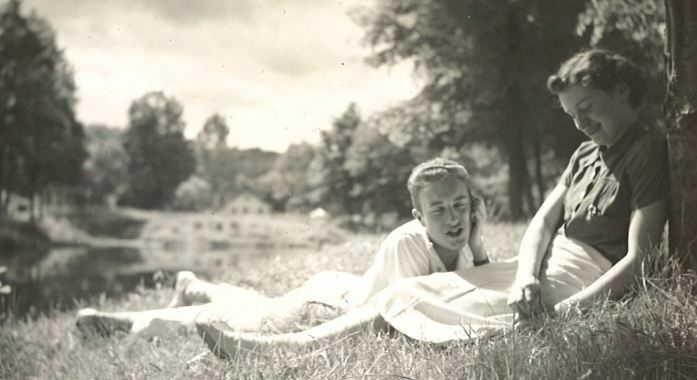 John and Dorothy together at Camp Hemlock, a friend’s property, in the summer of 1939. In 1941, John got drafted. During World War 2, local draft boards were used and set up to process and administer the registrations from coast to coast. All these boards assigned each of the registrants in its district a number. These numbers were called on the radio. John had a low number and one day, his number was called when he and his cousin Joan were sanding a chair for their grandmother. 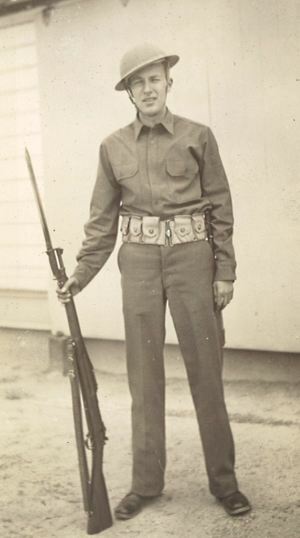 John was inducted into the Army on January 16th, 1941. He went straight to Fort Bragg, North Carolina, where he joined K Company of the 60th Infantry Regiment, 9th Infantry Division. The 9th Infantry Division went on amphibious maneuvers in the Chesapeake Bay. He remained down there until October 23rd, 1942. On October 23rd, 1942, John left Virginia on the ship “Susan B. Anthony” and landed on November 8th in Port Lyautey during Operation Torch. His daughter Gail was born the next day. After being in Algeria-French Morocco they went on to Tunisia until the middle of May 1943. Then on to Sicily from July to the 9th of August 1943. The Division left Sicily and sailed to England, landing there on Thanksgiving Day, 1943. John and the men of the 9th Infantry Division then prepared for the invasion of the continental Europe for the next 6 months. They landed at Utah Beach in Normandy on D-Day+4, June 10th, 1944 and were immediately given the important task of cutting the Cotentin Peninsula to split the German forces in two. After going through some heavy battles, the 9th Division managed to break out, and push further into France. 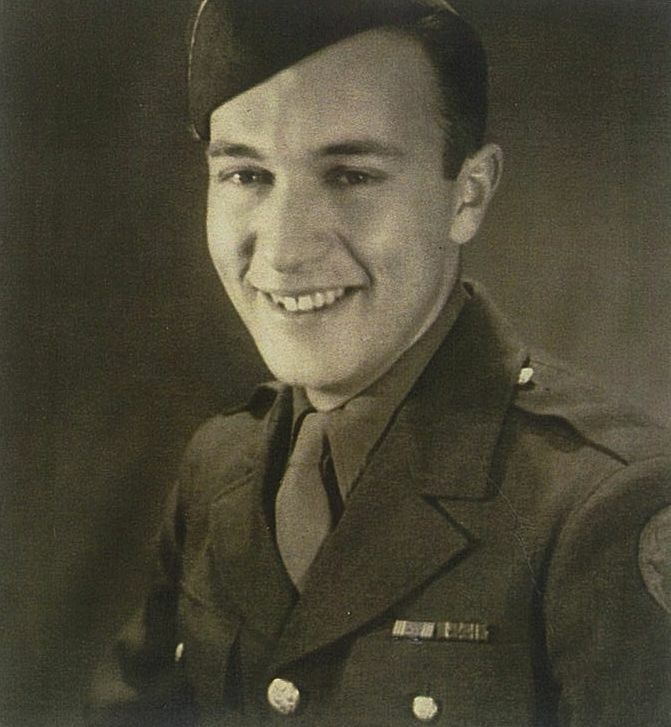 Towards the end of July 1944, John received a field commission to 2nd Lieutenant. Until late August 1944, the Allied push went fast, and the men of the 9th Division reached the German border early in September 1944. Little did they know, that this would be the start to one of the longest and heaviest battles for the men of the 9th Infantry Division: The battle of the Hurtgen Forest. After the battles through France and Belgium, men of the 9th Infantry Division crossed the border into Germany and were faced with the German fortifications known as ”The Siegfried Line”. These were situated inside the area known as the “Hurtgen Forest”. During the first attack of the 9th Infantry Division towards the road networks and the villages of Germeter and Vossenack, some heavy fighting ensued in an area known as “Raffelsbrand / Todtenbruch (Deadman’s Moor)”. The men of the 9th Infantry Division had to fight against enemy fire from these fortifications while receiving heavily concentrated mortar fire. Several pillboxes were taken, but some of them were more difficult to take. From September 25th 1944, attacks were made towards the pillboxes situated in their line of advance in the area near the crossroads situated in the south east. The crossroads were an important objective for the men of K Company, 3rd Battalion. It controled the road from Monschau in the south towards the city of Duren in the north as well. K Company worked down the west side of the main road, and found out that the pillbox was situated on the left of the main road. The pillbox held up the attack for nearly 2 days. On the morning of September 27th, 1944, another attempt was made, now with the main objective the bend in the road to the south west. This attack did not succeed. On the same day, at 12:00 hours, the enemy counterattacked, but was repulsed again at 12:45. Another attack that came at 15:00 was pushed back by 15:30. The day was filled with fire fights from both sides. It was during one of these September 27th 1944 attacks that 2nd LT. John Eisenhauer got hit. There was so much fighting going on that day that the other men were unable to get him right away. When they went back the next day they weren’t able to find John. John was declared “Missing In Action” for 3,5 years. 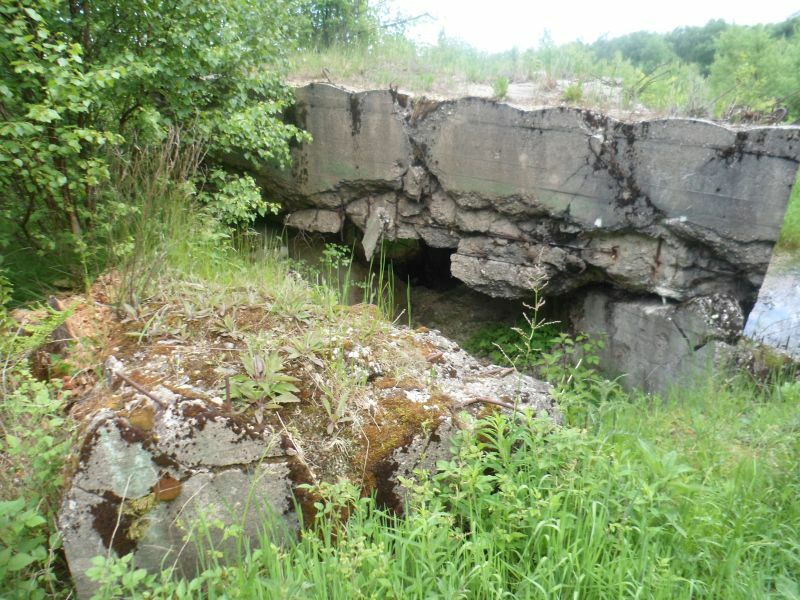 According to our research, this must have been the bunker that John Eisenhauer was trying to take, and probably was killed from machine gun fire coming from this bunker. In 1948, his body was found in the area he had been fighting in on that fateful September day to overtake the German pillbox. He then was buried at the Ardennes Cemetery in Neupre, Belgium on May 1948. A memorial in the form of an iron cross and plaque was erected as a tribute to 2nd LT. John Eisenhauer, and can be seen today near the Ringstrasse in the Raffelsbrand area. 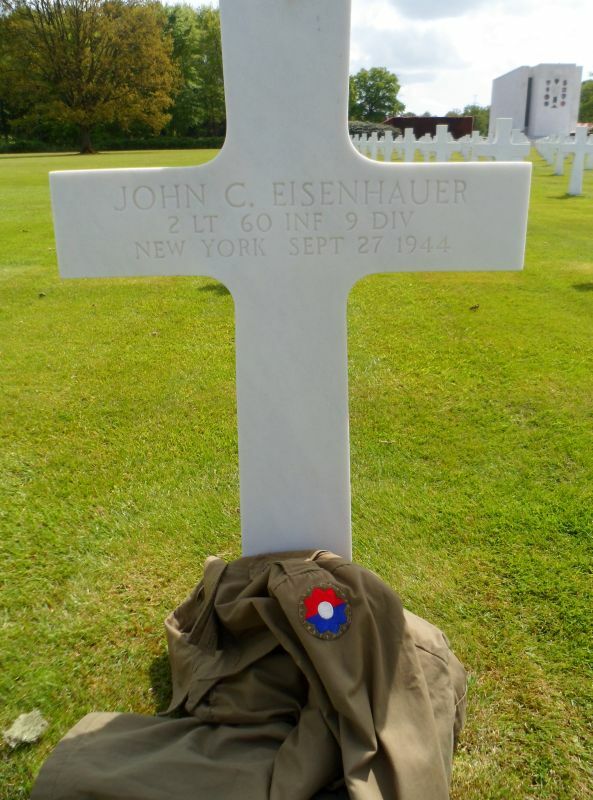 John C. Eisenhauer Grave at the Ardennes Cemetery in Belgium. The memorial for 2nd LT. Eisenhauer erected near the spot where his body was found in May 1948, not far from the bunker that he was trying to take. The shadow box that John’s daughter Gail made of her father’s belongings. Included are the original collar discs and Lieutenant bars that John carried on his uniform when his body was found. 2nd Lieutenant Eisenhauer had received a purple heart Medal with Oak Leaf Cluster, Bronze Star Medal, Good Conduct Medal, E.A.M.E. 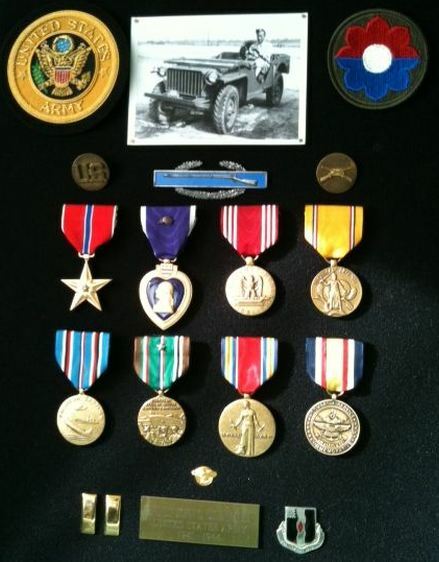 Medal with six Battle Stars and an arrowhead, the American Defense Medal, the Combat Infantryman’s Badge, and a Presidential Unit Citation. He has been a huge inspiration in my research. I am still in touch with John’s daughter Gail a lot, and she is doing some very good work for AWON, an organization devoted to preserving the memory of Americans who died or went missing in combat during the war. I will never forget 2nd Lt. Eisenhauer.